Originally opened as a celebration of British design and as a way of making art available to all, the V&A’s recent collaboration with industry experts Sofa Workshop continues this legacy by enabling you to bring the richest and most opulent designs from the archives of the world’s leading art and design museums into your home. 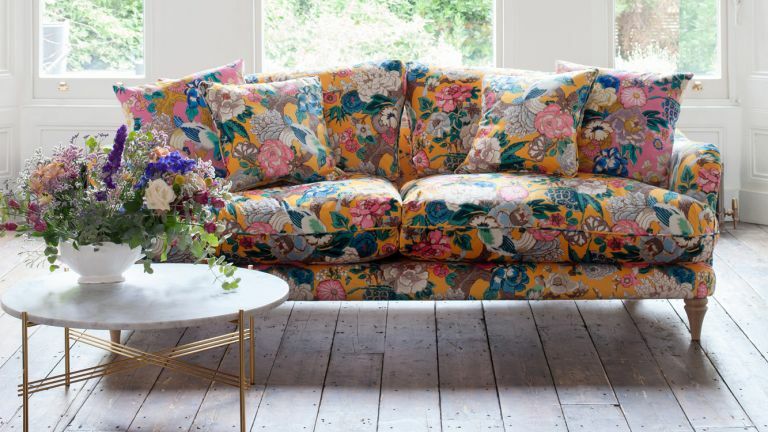 Inspired by the V&A’s rich archives in the first ever furniture collection by the museum, the craftspeople of British-based sofa maker Sofa Workshop have reworked original shapes to create three new living room suites in six exclusive fabric designs which beautifully unite the past with the present. Whether your style is bold and beautiful or elegant and demure there’s a style to suit your taste ranging from the Thurloe Chair in Luna Blossom to the vibrant Love Birds and Morton’s Marble prints. ‘At the heart of the exclusive, archive-inspired collection is a passion and commitment to British design and craftsmanship. There is a huge amount of expertise behind the collaboration from initial archive research through to finished design,’ says Megan Holloway, marketing manager, Sofa Workshop. Alongside the six fabric designs, the craftspeople at Sofa Workshop have reworked the original shapes of the Shaftesbury chair, Thurloe sofa, chair and stool and the Walpole sofa to create traditional shapes that are appealing to the modern customer. The range is now in-store, but you can have a peek at the Look Book now.